In Singer's youth, Warsaw was the epicenter of European Jewry. In 1908, he and his family moved to Krochmalna Street... 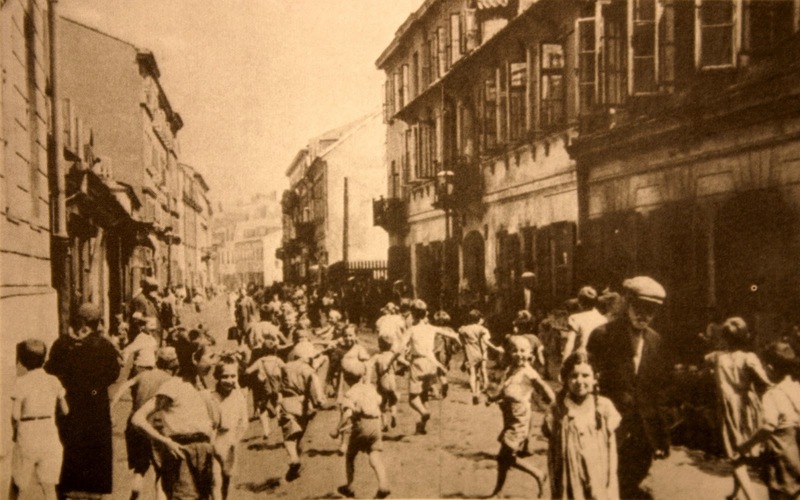 It was a congeries of tenement slums, street merchants, and small shops; a place where bearded men huddled curbside, discussing the mysteries of their religion; where women tended to the affairs of the home and market and kept kosher kitchens; and where children – impoverished ragamuffins – were everywhere. ... Singer added, "As far as I'm concerned, this was the center of the universe." That's pretty much exactly the theme of this song, which is attributed to Ben Zion Witler, whose performance you can find on Youtube: Krochmalne Gas Ulica Krochmalną Крахмальная улица Krochmalna Street. Somebody recently asked me for the words to this song and Jeannette Lewicki pointed out they can be found in the indispensable Mlotek collection Songs of Generations. On the Witler recording, you hear this first verse but he sings a second verse which is not in Mlotek. The Yiddish lyrics in transliteration, and my translation after the jump. Der yid vos raybt di hent fun kelt un trakht: vu nemt men koyln? Ikh volt gevolt a mames moyl zol mir a treyst-vort zogn. I would have wanted a mother's lipts to say a consoling word.